Brigitte Aphrodite’s eclectic stage show about depression My Beautiful Black Dog is proving a difficult beast to pin down in words. Featured in BBC’s 10’O Clock News and met with rave reviews in national press, it’s been described variously as a “punk musical”, “gig theatre” and “The Mighty Boosh crossed with the best episode of Girls” by Elle Magazine. Ahead of their tour date in Sheffield, Brigitte Aphrodite gives us some insight on what to expect from this highly original show. (Clue: it involves industrial quantities of glitter). What’s My Beautiful Black Dog all about then? The show’s totally like going to a gig, it’s predominantly music and a bit of poetry, it’s definitely for music fans, lyric fans and fans of punk poetry. It’s got mental health at its heart – but only in the way that every good album has mental health at its heart. It’s not ramming an issue home. It’s kind of like a gig/visual/spoken word representation of what somebody’s brain heart and soul can look like, but in a relatable way. Lots of unusual costumes, which is another layer, if people like fashion then there’s plenty of interesting visuals. There is an arc, a journey but it’s like opening somebodies brain and heart. There’s a bit of a love story, but it’s written autobiographically. But it isn’t wanky. How did you find writing about such personal experiences? It took ages to write. Our musical director, Gaz Tomlinson who’s in a band called Quiet Boy, is the only other human being in the show and he’s also my partner of 11 years. So it really added to that personal thing that we were making something with a lot of detail, a lot of research and soul searching. I’m now very close to everyone involved, so what we’ve made ends up being really fun too. The audience are invited in to this friendly party vibe, which is weird because it’s about mental health and takes that subject matter really seriously. But essentially it’s like going to a gig so we thought Picture House Social would be the best place in Sheffield to do it! What’s this about the audience having glitter at the shows? It’s a tradition, every Christmas I used to get the Christmas cards off the shelf and rub the glitter all over my face. And I’ve always been obsessed with shiny surfaces as well as the real deep stuff. So when I started doing gigs in my early twenties I thought “right here’s a chance for me to do what I want” so I used to force the audience members to wear glitter. That was before glitter was trendy and when we found out it was bad for the ocean. But now we get biodegradable glitter. Now I’ve sort of grown up a little, it’s optional, but it is strongly encouraged. Once you come and see the show you understand how it plays a part. How is the experience for you? It’s really nerve-wracking, before the show because I know I have to go on quite high octane physically, vocally. Anybody who does gigs knows it takes a lot of energy – that’s scary. I run to the toilet about ten times before the show. But I supposed it is a bit cathartic afterwards because you’re sharing you experience, you get to express and talk about it. The show’s a perfect vessel for opening up about what people are feeling. My favourite part of the show is in the pub or bar afterwards you get to talk to people about their experiences, rubbish times they’re going through at the moment – it’s quite an opener-upper. And how do people react to the show? We get quite strong reactions, people get emotional, joyous, some people need to go home. We’re trying to create a sort of quiet space after the show at Picture House Social, so if you don’t feel like you want to talk to anybody you don’t have to go to the toilet and put your head in your hands before you get public transport home. We have a chat and put some good music on in the bar afterwards, it’s important to us to talk about what’s going on locally mental health-wise, and also normal stuff, music love, what you had for dinner! So what’s ahead for the MBBD, and yourself? This is the last tour we’re gonna do, but it’s been confirmed we’ve got a little bit of money together and we’re gonna record the album so people will be able to own the music and listen to it forever. Maybe one day the scripts will be printed out. The music will definitely be in yer earholes around November. In an ideal world, what wider impact would you want your show to have? More financial support for mental health services so that having someone to talk to would be as important as going to a GP. People are talking a bit more about mental health but the stigma is still there so the government needs to put the money where its mouth is and give it proper funding. I’m not saying my show can do that, but in an ideal world. On a more personal level, I guess me singing and dancing and screaming about this can be the catalyst for someone else’s personal change, or at least be a bit of solace, to know you’re not alone -you know? 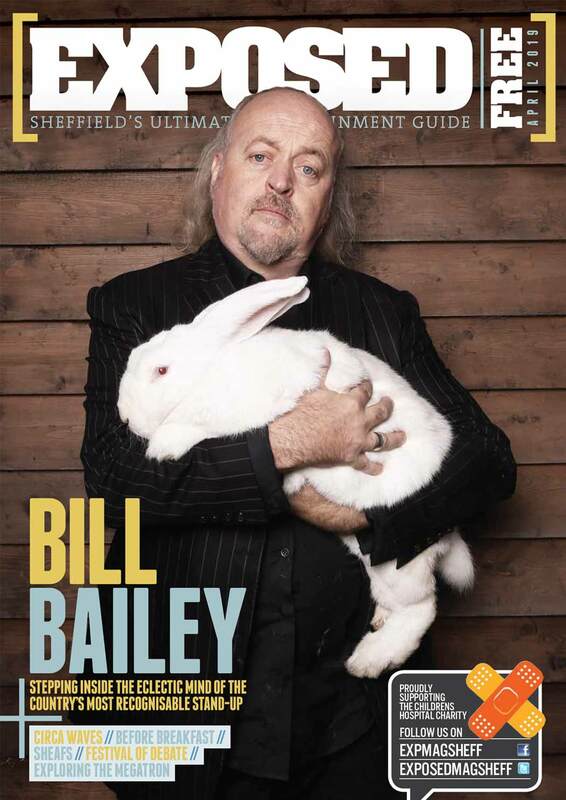 Finally, are you looking forward to bringing the show to Sheffield? I’ve never played in Sheffield before, I’ve never even been but everyone I’ve met who is from Sheffield I’ve fallen in love with. Our director’s from Sheffield and I love the music scene so I’m very excited to play there! My Beautiful Black Dog will be at Picture House Social 14 October, get your tickets here.